A greeting card is the perfect way to express your emotions to your loved ones. This is a simple gesture that goes a long way in strengthening your bonds with those you love. There are many types of cards available in the market but a personalized card effects in its own way. Creating a card on your own rather than buying one is a good thought. You can easily create a card yourself using Greeting Card Studio. Download greeting card software and you can create your individual and attractive cards within minutes. You can also save on a lot of money which you would otherwise spend on buying expensive cards and gifts. This greeting card maker comes with an easy-to-use card creating interface which enables you to design your cards with just a few clicks. Greeting card software download doesn't take long and gets installed easily on your system. It has pre-designed templates for cards from where you can choose the one you like and create an interesting card. Creating a card using this free printable card making program is easy and with just three simple steps you can come up with an appealing card. Choose from various pre-designed greeting card templates. Customize the card by adding your message, text, font, colors, etc. Print or email your card. Apart from these easy steps to card creation, you can use other features of this card maker software to brighten your greeting card. First of all, if you are creating a card on your own, the best thing you can do is, insert your picture or a picture of the person you are designing the card for. This will give an amazing personalized effect to your card. Next, you can adorn your card with decorative and colorful borders. Inserting a personal message, which you would otherwise write by hand will also give your card an attractive look. You can add shapes and call outs to your card to add the message too. Rather than having plain white or colored background, you can choose designer backgrounds for your greeting card. With this software from Greeting Card Studio, you can also add a variety of graphic symbols to your card. With a wide selection of card templates, it will become fairly easy for you to design your own card even at the last moment. You get templates for every occasion in this software and creating a card is thus, no more a difficult task. 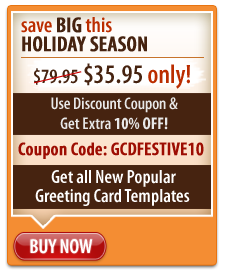 This greeting card software from Greeting Card Studio is user-friendly and extremely functional. By using this software, you cannot create cards alone, but other pieces of communication such as posters, invitations and announcements too. Therefore, this is 4-in-one software and can be utilized for multiple creations.